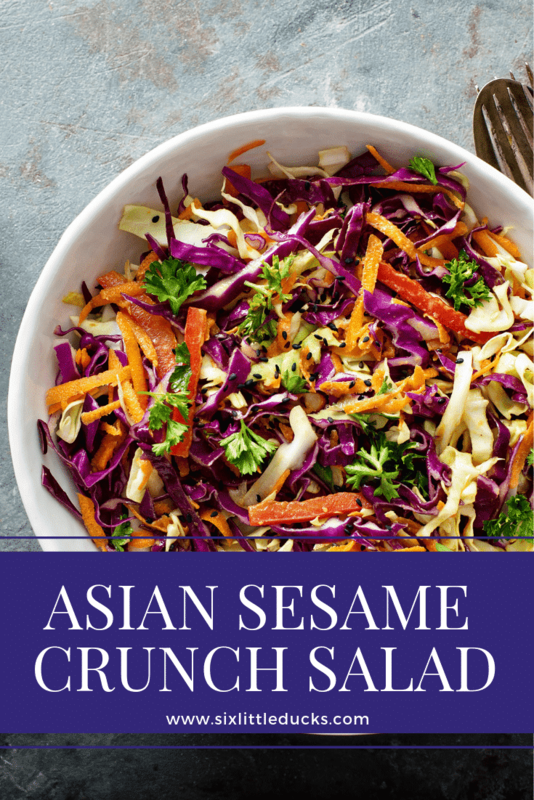 I created this Asian Sesame Crunch Salad because I wanted a salad I could throw together quickly. I also wanted an Asian Sesame flavor lots of crunch and ‘good-for-me' vegetables such as kale and cabbage. This salad comes together very quickly, using easy-to-find items from Trader Joe's or the grocery store. 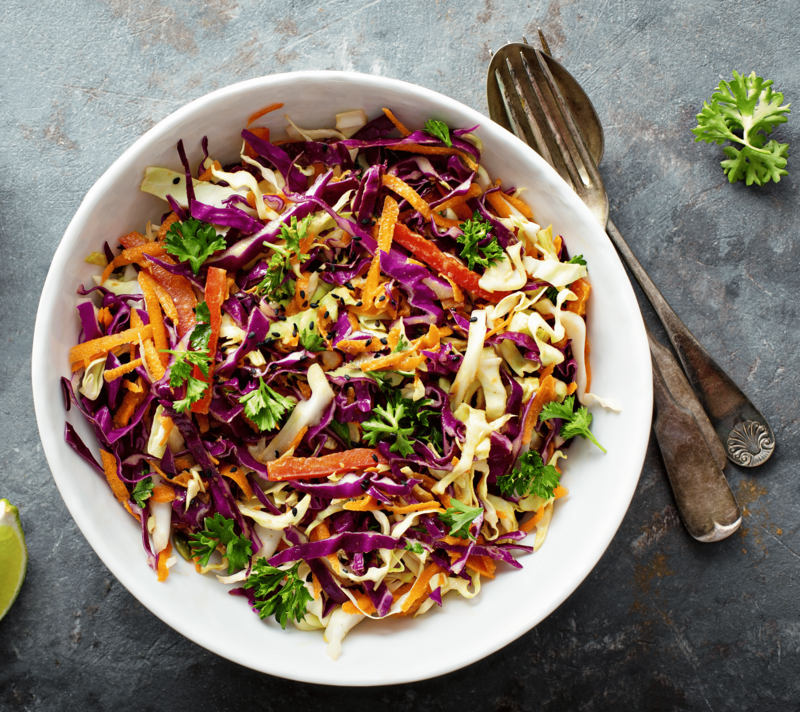 Flavor and crunch are important to me and this salad delivers! If you don't have a Trader Joe's near you, you should be able to find comparable items to the cabbage/kale/Brussel sprout blend and the broccoli kale slaw in your local grocery stores. If you can't find Ken's salad dressing, substitute what you can find that is Asian Sesame (or similar). Adjust points accordingly (Ken's is 3 Points per 2 Tbsp). My inspiration for this recipe was that it was A) quick, B) had the Asian Sesame component I was looking for, and C) crunchy with vegetables, won ton strips (a favorite of mine in salads) and almonds. Helpful Hint: I find the won ton strips in the produce section of my grocery store. There's a huge rack of all different flavors of won tons. Optional Add-Ins: If you want to add protein to this recipe, you can throw in sliced or shredded chicken breast for zero additional points! Boca Spicy Chik'n Cobb Salad This is a favorite salad in my house. It makes for a very filling lunch or dinner!! Greek Goat Cheese Salad – I love to throw this together for an easy weekday lunch. 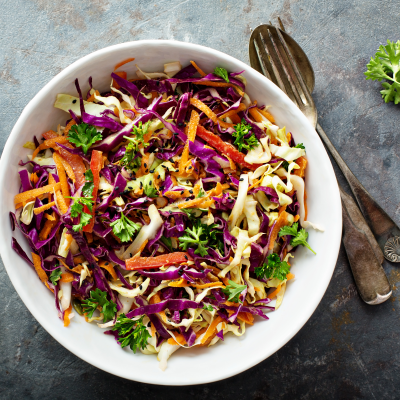 Add cabbage, kale, Brussel sprouts, broccoli slaw, kale slaw, lettuce, carrots, and edamame to a bowl. Slice red pepper into small, thin strips and add to bowl. Chop all together into small pieces. I chop it directly in the bowl. Add dressing and mix thoroughly. Divide into two equal portions. Top each serving with half of each of the won ton trips and sliced almonds. Serve!